Improve and expand on an existing CRM application. I took over as the lead designer and front-end developer on this project, and was responsible for a number of upgrades to the app. Those upgrades included enhanced notetaking abilities, vastly improved search functionality, the addition of task priority levels, and the creation and integration of two brand new features. Significant changes were needed to the layout, content, and overall design of both the application and the portal. In addition to any edits that needed to be made with each new release, I also optimized everything for mobile. This included giving more thought to exactly how to handle displaying data-rich tables on smaller devices, among other things. The first update I made to Pilot was an expansion of the notetaking abilities. Users had requested multiple note types (as opposed to a single notes field), so we gave them the ability to create new note sections as needed. I used a tab system to separate the sections, which switches over to a dropdown menu on mobile. Feedback was a new feature which gave users a simple way to request feedback from their customers via email. Data from completed feedback forms is then stored within Pilot under both the customer and the employee. Help Desk was another new feature which increases the efficiency of customer service by streamlining the response process. 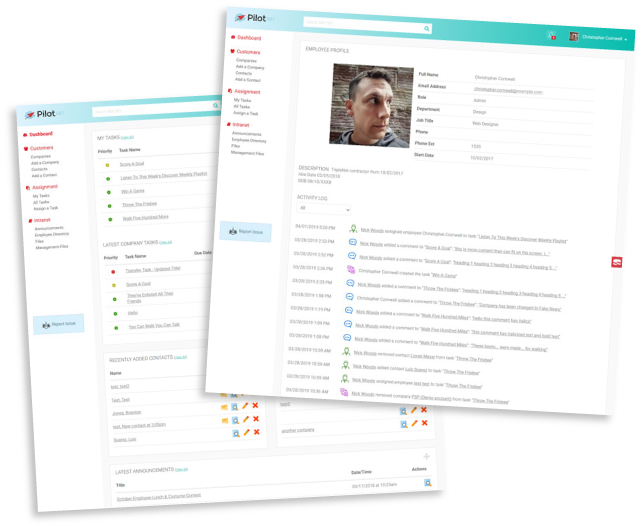 It essentially provides employees with a communal inbox to gather help requests, and then stores all of those emails under both the customer and the responding employee. I was also tasked with creating various marketing materials describing Pilot SBT to potential clients. In addition to brochures and flyers, I also created in-house user guides and walkthroughs for various features.